Alternates with Cornwall Transit every Tuesday. Devon Transit 002 was 27th January. A look back on the last couple of weeks on VOSA and a look forward to the next couple of weeks planned timetable changes. We then follow with the full of proposed cutbacks to tendered services by Devon County Council. Plenty to get through! PH1020951/183 - STAGECOACH DEVON LTD T/A Stagecoach South West, BELGRAVE ROAD, EXETER, EX1 2LB Variation Accepted by SN: Operating between Holsworthy and Bude given service number 6/6A effective from 22-Feb-2015. To amend Timetable. PH1020951/184 - STAGECOACH DEVON LTD T/A Stagecoach South West, BELGRAVE ROAD, EXETER, EX1 2LB Variation Accepted by SN: Operating between Okehampton and Holsworthy given service number 6 effective from 22-Feb-2015. To amend Timetable. PH1020951/185 - STAGECOACH DEVON LTD T/A Stagecoach South West, BELGRAVE ROAD, EXETER, EX1 2LB Variation Accepted by SN: Operating between Exeter and Okehampton given service number 6A/6 effective from 22-Feb-2015. To amend Timetable. PH1020951/217 - STAGECOACH DEVON LTD T/A Stagecoach South West, BELGRAVE ROAD, EXETER, EX1 2LB Variation Accepted by SN: Operating between Launceston and Okehampton given service number 6A effective from 22-Feb-2015. To amend Timetable. PH1020951/29 - STAGECOACH DEVON LTD T/A Stagecoach South West, BELGRAVE ROAD, EXETER, EX1 2LB Variation Accepted: Operating between University of Exeter and Digby given service number D/H effective from 02-Feb-2015. To amend Timetable. As can be seen above there are a lot of VOSA notices for new service 6 6A. Licences PH1020951/183,184,185,217 are for the main service which was previously Stagecoach X9. New licences PH1020951/222,223 are for positioning and also to introduce a Sunday run. All of this is to cover the withdrawal of Western Greyhound from the 510. Why the change to 6/6A? Well, 6 was the number used by Devon General for its service to Okehampton between 1930s and 1970s. The new service brings all services between Exeter and Okehampton into one timetable giving season Stagecoach ticket holders more journey choices, and a “new” number seemed like a good way to highlight this! 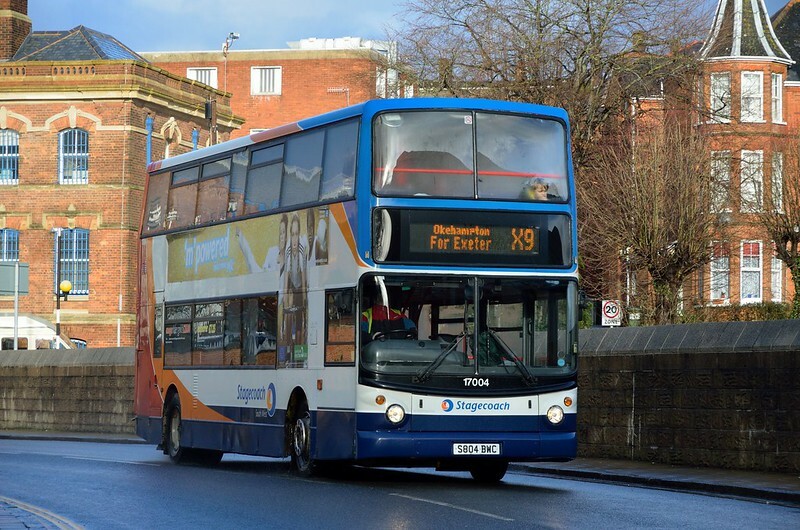 PH1020951/167 - STAGECOACH DEVON LTD T/A Stagecoach South West, BELGRAVE ROAD, EXETER, EX1 2LB Variation Accepted by SN: Operating between Exeter St David's Station and Exmouth Bus Station given service number 56/56A effective from 23-Feb-2015. To amend Timetable. PH0007025/44 - DART PLEASURE CRAFT LTD T/A RAIL RIVER LINK BUSES, DART PLEASURE CRAFT LTD, STEAMER QUAY ROAD, TOTNES, TQ9 5AL Variation Accepted: Operating between CHURSTON STEAM RAILWAY STATION and GREENAWAY HOUSE ( NATIONAL TRUST PROPERTY) given service number NT1 effective from 28-Mar-2015. To amend Timetable. PH0005305/22 - DEALTOP LTD T/A DARTLINE COACHES, UNIT 2, LANGDON BUSINESS PARK, OIL MILL LANE, CLYST ST. MARY, EXETER, EX5 1AF Cancellation Accepted by SN: Operating between Crediton, High Street and Crediton, High Street given service number 341 effective from 14-Mar-2015. PH0005305/42 - DEALTOP LTD T/A DARTLINE COACHES, UNIT 2, LANGDON BUSINESS PARK, OIL MILL LANE, CLYST ST. MARY, EXETER, EX5 1AF Variation Accepted: Operating between Sidmouth Road and County Hall Car Park given service number PR6 effective from 16-Feb-2015. To amend Route. Other Details: Monday to Friday. Operating from the Monday before Easter to the last Friday of October annually. Service 1 Exeter - Pinhoe - Broadclyst - Bradninch - Cullompton - Willand - Uffculme - Tiverton Parkway - Sampford Peverell - Halberton - Tiverton. Service 5 Exeter - Cowley Bridge - Newton St. Cyres - Crediton. Service 7 Exmouth - The Marles - Masey Road. Service 7 303 South Molton - Filleigh - Swimbridge - Landkey - Barnstaple & Woolacombe - Braunton - Barnstaple. Service 8E Barnstaple - Whiddon Valley / Roundswel. Service 8 10 Barnstaple town services - Whiddon Valley/Forches/Gorwell/Roundswell/Woodville. Withdrawal of financially supported frequency enhancements. Frequency would reduce to half hourly instead of every 20 minutes. One route in Gorwell would need to be withdrawn, as there are presently three different routes, which would need to reduce to two. Entails withdrawal of small sections of route. Could lead to overcrowding at certain times. Service 9 Barnstaple - Newport - Bishops Tawton. Service 14 Bideford - East the Water - Goaman Estate. Service 15X Bideford - Clovelly Road - Atlantic Village. Withdrawal of the 0745, 1820 and 1850 journeys from Bideford and 0800, 1835 and 1905 journeys from Atlantic Village. Low usage. Alternative commercial services at 0721 and 1754 from Bideford and 0745 and 1825 from Atlantic Village. May affect a very small number of workers. Service 16 Bideford - Cornborough Road - Westward Ho! - Appledore - Morwenna Park - Bideford. Proposal 1: Withdrawal of 1810 and 1830 journeys from the Park & Ride as far as the Bus Station and the 1820 and 1840 journeys from Queen Street to the Park & Ride. Proposal2: Withdrawal of the Saturday service between the Park and Ride site and the Bus Station/Queen Street. Service 25B Dulverton - Bampton - Shillingford - Wiveliscombe - Taunton. This is a contribution towards a Somerset County Council contract, Taunton - Dulverton. Low usage from Devon section. Bampton retains principal service to Tiverton. Service 30 Axminster - Millwey Rise - Chard - Ilminster - Taunton. Service 33 34 35 36 Ilfracombe Town / Lee Bay / Berrynarbor. Service 39 Exeter - Chudleigh - Chudleigh Knighton - Bovey Tracey - Heathfield - Drumbridges - Newton Abbot. Service 49 Heybrook Bay - Down Thomas - Wembury Point - Plymstock - Plymouth. Reduced from 3 journeys to 2. Revised service will provide a return shopping trip into Plymouth, operating approximately 90 minutes later than at present. Service 53 Exeter - Clyst St Mary - Newton Poppleford - Sidford - Beer - Seaton - Colyford. Complete withdrawal. Alternative commercial service (X53) available fifteen minutes earlier. Affects work journeys. Service 55 56 Tavistock - Yelverton - Crapstone - Buckland Monachorum - Milton Combe / Meavy - Dousland - Walkhampton. Service 55 is reduced from 7 journeys to 5. Service 56 continues to have 5 journeys. There will no longer be journeys for Buckland Monachorum School. Service 55 624 Buckland Monachorum - Yelverton. Withdrawal of schooltime services. Morning schooltime bus is withdrawn as part of changes to service 55. Afternoon bus will carry entitled pupils only, with no room for those paying their own fares. No alternatives available. Service 55B Exeter - Stoke Canon - Rewe - Thorverton - Silverton - Bickleigh - Tiverton. The 0730 Exeter - Tiverton journey will run 25 minutes earlier. Service 59 Plymouth - Plympton - Sparkwell - Lutton - Cornwood - Lee Moor - Wotter - Shaugh Prior - Bickleigh - Roborough. Service reduced from 7 journeys per day to 4. The revised service will still provide a peak time journey to and from Plymouth and a choice of shopping journeys. Retains service to Shaugh Prior School for entitled pupils. Otherwise retains work and shopping-time services to Plymouth but with reduced options. Service 70 Newton Abbot - Highweek. Service 75 Barnstaple - Bideford - Torrington - Merton - Meeth -Hatherleigh - Folly Gate - Okehampton. Withdrawal of the 0655 and 1500 Barnstaple - Okehampton, 1040 and 1640 Okehampton - Barnstaple, 0840 Okehampton - Hatherleigh and 0900 Hatherleigh - Okehampton. Entitled school pupils to Okehampton College will still be catered for. Some non-entitled school pupils and workers will be affected. The 0815 Bideford - Okehampton will operate via Hatherleigh to replace the withdrawn 0900 journey. Service 77 Newton Abbot - Buckland Estate . Complete withdrawal of Sunday and Public Holiday service. Service 82 Exeter - Longdown - Dunsford - Moretonhampstead - Postbridge - Princetown - Yelverton - Tavistock. Service 85C St Giles on the Heath - Chapmanswell - Clawton - Holsworthy - Stibb Cross - Bideford - Barnstaple. Complete withdrawal. Alternative service 85 journey is available for all points between Holsworthy and Barnstaple. Entitled students from the St Giles on the Heath - Holsworthy section will still be catered for. Service 86 Tavistock - Bishopsmead - Horrabridge - Yelverton - Woolwell - Plymouth. Service 87 Bere Alston - Tavistock. Service 90B Dartmouth - Archway Drive. Service 91 Totnes - Avonwick - Ugborough - Ermington - Brixton - Plymstock - Plymouth. Service 93 Dartmouth - Stoke Fleming - Strete - Slapton Turn - Torcross - Stokenham - Chillington - Frogmore - West Charleton - Kingsbridge - Churchstow - Aveton Gifford - Modbury - Yealmpton - Brixton - Plymouth . Service 94 Noss Mayo - Newton Ferrers - Membland - Holbeton - Yealmpton - Brixton - Plymstock - Plymouth. Service 98 Tavistock - Greenlands - Princetown - Two Bridges - Postbridge - Bellever/Yelverton. Service 99E Exmouth - Littleham/Brixington. Service 113 132 260 Tavistock - Dawlish / Torquay / Truro. Service 149 Totnes - Berry Pomeroy - Marldon - Torbay Hospital - The Willows - Torquay. Complete withdrawal. Entitled pupils to KEVIC's will be catered for by a school contract service. Journeys from Totnes to Marldon, The Willows and Torbay Hospital will be covered by a new service funded by Torbay Council, which Devon County Council will contribute to. This will provide an hourly link from Totnes - Torbay Hospital, with alternate journeys via Marldon and The Willows. Service 157 Exmouth - Littleham - Budleigh Salterton - East Budleigh - Otterton -Bicton - Colaton Raleigh - Newton Poppleford - Sidmouth. Withdraw of the funding for operating via Otterton. The withdrawal of funding may result in a reduction in frequency on the entire route. Service 162 Kingsbridge - Thurlestone - South Milton - Galmpton - Hope/Loddiswell. Withdraw the 1700 Kingsbridge - Loddiswell, 1715 Loddiswell - Kingsbridge, 1730 Kingsbridge - Hope and 1815 Hope - Kingsbridge. Service 178 Newton Abbot - Liverton - Bovey Tracey - Lustleigh - Moretonhampstead - Chagford - Whiddon Down - South Zeal - South Tawton - Sticklepath - Okehampton. Service 184 Newton Abbot - Kingsteignton - Bishopsteignton - Teignmouth. Service 187 Okehampton - Sourton - Lydford - Brentor - Mary Tavy - Tavistock - Morwellham - Gunnislake. Complete withdrawal. Part of Dartmoor Rover network. Service 271 Newton Abbot - Bovey Tracey - Haytor - Widecombe - Manaton, 'Haytor Hoppa'. Withdrawal of County Council financial support. Joint arrangement (50/50) with Dartmoor National Park. Dartmoor National Park could elect to carry on with 100% funding of their own. Service 300 Barnstaple - Braunton - Ilfracombe - Combe Martin - Lynton - Lynmouth - Countisbury (winter) - Porlock (winter) - Minehead (winter). Complete withdrawal.Brendon and Countisbury will be served solely by Community Transport. Service 301 Barnstaple - North Devon Hospital - Muddiford - Milltown - Ilfracombe - Berrynarbor Corner - Combe Martin. Withdrawal of the 1805 Ilfracombe High Street - Tesco journey. Service 302 Ilfracombe - Mullacott Cross - Woolacombe. National Bus Pass to be no longer valid. Service runs primarily for tourism and is therefore not part of the statutory scheme. Service 303 Mortehoe - Woolacombe - West Down - Braunton - Heanton Punchardon - Ashford - Barnstaple. On Tuesday would operate from Mullacott Cross to Barnstaple via Guineaford Bridge, Prixford and Bradiford. Due to being diverted to replace sections of withdrawn Service 654. West Down, Heanton Punchardon and Ashford retain service on other days. Service 307 Barnstaple - Landkey - Swimbridge - Filleigh South Molton - Oakford - Bampton. Complete withdrawal. Lessens choice, but main settlements have services to other destinations. Service 318 Okehampton Town service. Withdrawal. A shopping journey for Giblands Park, Hunters Gate, Leeze Park and the Station is provided by a revised service 178. North Tawton to Okehampton retains peak time buses. Giblands Park has alternative services along Exeter Road. North Tawton and Sampford Courtenay served by commercial Stagecoach Service 5A. B3215 via Sampford Courtenay Station served by weekly Services 631 and 648. Exeter Road, Crediton Road, Limehayes Road and Hospital served by supported Service 11. Ring & Ride provides an in-town service on Tuesday, Wednesday and Thursday. Service 322 Ashreigney - Riddlecombe - Roborough - St. Giles-in-the-Wood - Torrington / Bideford / Barnstaple. Wednesday service to Barnstaple to be rerouted via Yarnscombe and Tawstock in place of Service 664. Would not go to Torrington or Bideford on that day. Withdraw Thursday service. Enables withdrawal of Service 664. All communities on Service 322 route retain at least a weekly shopping-time bus on different days to Torrington, Bideford and Barnstaple. Service 325 Lapford - Chawleigh - Chulmleigh - Burrington - High Bickington - Atherington - Bishops Tawton - Barnstaple. Reduce to operate on Tuesday and Friday. Lapford, Chawleigh and Chulmleigh retain a Monday - Saturday service to Crediton and Exeter. Service 343 Tiverton (Palmerston Park/Cotteylands/Higher Moor). Revisions to timetable and route. Frequency reduced. The 1535 journey from Tiverton High School is withdrawn. Journeys to Palmerston Park and Cotteylands operate from the Bus Station at 0830, 0915, 1115, 1215, 1345, 1445 and 1645. The section of route to Higher Moor will operate hourly. The section of route via Southfield Way will be withdrawn to allow a larger bus to be used. Service 347 Cheriton Fitzpaine - Stockleigh Pomeroy - Shobrooke - Crediton. Service 348 349 Tiverton Town (Cowley Moor / Higher Moor). Frequency reduced to hourly. Withdrawal of the 0615 and 1815 journeys from the Bus Station. Service 348 will operate between Tiverton and Cowley Moor only, not serving the Business Park. Higher Moor will be served by a revised 343 service. The link to Tiverton High School is retained. Service 352 353 Tiverton Town (Tidcombe & Wilcombe). Reduce service from half-hourly to hourly. Service will operate at 0805 from the bus station and then 0945, 1015, 1045, 1145, 1245, 1315, 1415, 1515, 1550, 1615, 1715 and 1815. The 0740 journey from the Bus Station is withdrawn. The link to Tiverton High School would be maintained. Service 357 Byron Way - Exmouth - Littleham - Budleigh Salterton. Proposal 2: Complete withdrawal - Monday - Saturday evenings - from the 1850 Byron Way - Budleigh Salterton and 1920 Budleigh Salterton - Byron Way. Service 360 Bridford - Christow - Doddiscombsleigh - Dunchideock - Ide - Exeter. Withdrawal of the 1500 Exeter - Ide; 1524 Ide - Exeter and 1842 Bridford - Exeter journeys. Ide retains work and shopping-time journeys. 1842 journey is not well used. Withdrawal of 0903 Hennock - Christow and 1355 Christow - Newton Abbot journeys - these connect with Service 360 for journeys to and from Exeter. Lessens choice of destination but villages retain main service to Newton Abbot. Lack of use of Exeter connection means no passengers lost. Reduced from 4 journeys to 2. Revised service will provide a return shopping journey to Exeter. This affects work travel from Kenn, Clapham, Shillingford St. George and Shillingford Abbot. For Kennford, alternative services (X46 and X64) stop on A38. Entitled students to Exeter College will be catered for by alternative arrangements. Withdraw 0725 Heathfield - High Street journey and all journeys after the 1610 High Street - Heathfield: 1510 (Saturday and School Holidays), 1630 and 1730 Heathfield - High Street, 1710, 1810 High Street - Heathfield. Alternative services available, 4/4A, 20, 52B, albeit at some walking distance. Reduce to Wednesday & Saturday only. Sidmouth - Ottery St. Mary - Honiton section to run on Saturday only. Service will operate via Feniton to replace withdrawn Wednesday and Saturday service 694. Service has a limited unique function. Except for Smeatharpe, villages on Honiton - Taunton section have alternative services to Honiton. Main services between Sidmouth, Ottery St. Mary and Honiton are Services 52B and 382. Wiggaton retains a weekly link. Also serves passengers from Churchinford in Somerset, although Somerset CC make no financial contribution. Withdrawal of the 1640 service 391 and 1700 service 392 journeys. Due to low usage of these journeys. Complete withdrawal. The Uplowman - Tiverton section, to be replaced by a revised service 697 running on Friday instead of Tuesday, Hemyock and Culmstock have main service (20) to Honiton, Wellington and Taunton. Redesigned local network still caters for most demand. Complete withdrawal. Guineaford Bridge & Prixford section replaced by a diverted Service 303 journey. Goodleigh section replaced by an extension of service 658. Withdraw Friday journey. Tuesday journey would leave Barnstaple at 1320 instead of 1230. Tuesday journey operates later due to being extended to replace Goodleigh section of Service 654. Complete withdrawal. All points except Beaford will be served by a revised service 322 on Wednesday. Still caters for current demand but on a different day. Beaford is served by daily Service 5B. Complete withdrawal. The Ellerhayes - Poltimore - Exeter section will be replaced by a re-routed service 678. Ashill to be served by extended Fare Car F18 to Cullompton. Holcombe Rogus, Westleigh and Burlescombe also have service (697) to Tiverton. Culmstock also has service (20) to Honiton, Wellington and Taunton. Kenstisbeare also has service (694) to Cullompton. Redesigned local network still caters for most demand. Witheridge and Nomansland have alternative service (155) to Exeter. Thorverton has alternative service (55B) to Exeter. Reduce to Tuesday, Thursday & Friday only. Service 387 will also serve Feniton - Honiton on Wednesday and Saturday. Route will run on Friday instead of Tuesday and is extended to include Uplowman. Replaces Uplowman section of withdrawn Service 397. Service to operate on Monday instead of Friday. Reduce to operate on Friday only. Reduced to operate on Monday, Tuesday, Thursday and Friday only. Due to vehicle being used on Wednesday to operate service 888. Current timetable not shown on Journey Devon. Proposal 1: Withdrawal of enhanced frequency during University Vacations. Service would operate half-hourly from Digby to the University Monday - Friday during University Vacations. Proposal 2: Withdrawal of enhanced Saturday service. Service would operate half-hourly from Digby to the University. Reduce to Tuesday and Friday. Revision retains the best-used days. The area also retains weekly bus services to Honiton. Fare Car serves people not living on bus routes. Reduce to Saturday Only. F7 was reduced in April 2011 from daily to twice weekly but usage is still very low. Area retains Friday bus to Ivybridge and Plymouth via revised Service 875. Complete withdrawal. All existing Fare Car passengers can be served by the Tiverton Ring and Ride. Reduce to operate on Saturday only. Parts of the area retain weekly bus services. Fare Car serves people not living on bus routes. Complete withdrawal. F12 was reduced in April 2011 from daily to Tuesday & Friday only but usage is still very low. The area retains weekly bus services to local towns and all current Fare Car passengers live on bus routes to Okehampton. Complete withdrawal. Fare Car was introduced to improve accessibility but area now has daily low-floor bus service so Fare Car usage is very low. To be extended to serve Ashill. Replaces part of Service 675. Passengers transferring from bus to Fare Car will no longer be able to use their National Bus Pass. Complete withdrawal. D.C.C Financially supports the section of route between Countess Wear and Topsham Quay. Alternative bus (and rail) services available from Station Road or High Street. Reduced service - service U reduced to three journeys giving a morning shopping service and M to two journeys. THE HOP12 bus will return to Torquay town centre from Monday morning. Traders had complained that work in Fleet Street was ‘killing the town’ and that the cancelling of bus routes into the town centre had left them struggling to survive, but the news that buses are to return has delighted them. 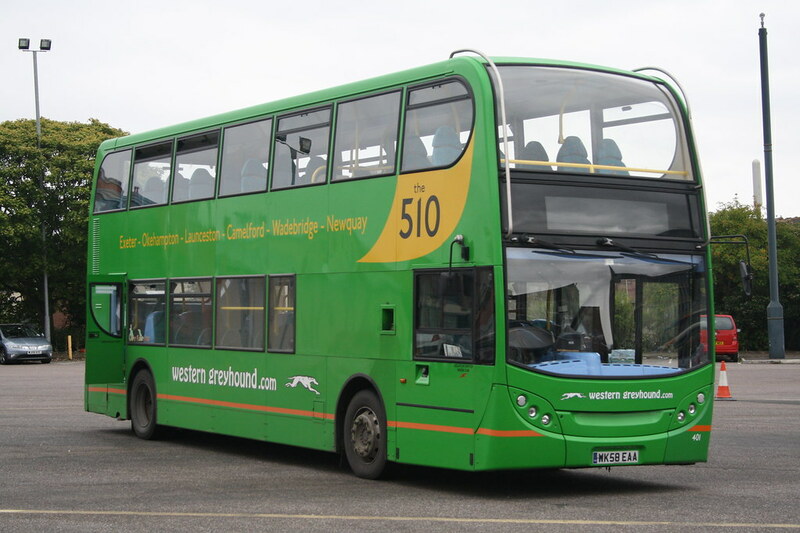 Great Yarmouth Bus Page: Rare workings on the X1 and more! East Anglian Rail Scene: Weekly Overview. Phew. Brilliant, and thanks. One question. WG 510 is replaced by Stagecoach 6A, with a worse service between Oakhampton and Launceston. But what about the west of Launceston? Nothing at all yet on the WG website about any changes, let alone the 510 being axed. Or have I missed something in your Cornwall briefings? WG are def cancelling the 510 - as will be seen on next Tuesdays Cornwall Transit post (they just missed last weeks). Asd for their web site - I don't think they have looked at it at all. Presumably they will update their web site sometime soon? Historically in the 1990s Fry's offered a daily Camelford to Plymouth shopping service and similarly Tilley's offered Camelford to Exeter and that was all. Launceston and Okehampton were covered in passing by these but there was a 186 which provided 3 trips a day from Launceston to Okehampton like the 6A will. First added the X10 from Boscastle to Exeter using buses from Bude to compliment the X9 giving Launceston to Exeter 3 or 4 journeys a day and the 186 became an Okehampton to Launceston shopping service. The X10 and the subsequent 510 expanded this a bit more over the years, but was it just joining up different markets with a pretty dead centre section. As Stagecoach says the 6A covers Cornwall's main needs economically with 2 buses. Camelford has school and shopping trips to Bodmin, Wadebridge and Bude with onward connections. Is any more worth the cost given Cornwall's budget and any other WG reductions (I haven't seen WG's changes particularly for evenings, Sundays or the 551 from the end of March. ).